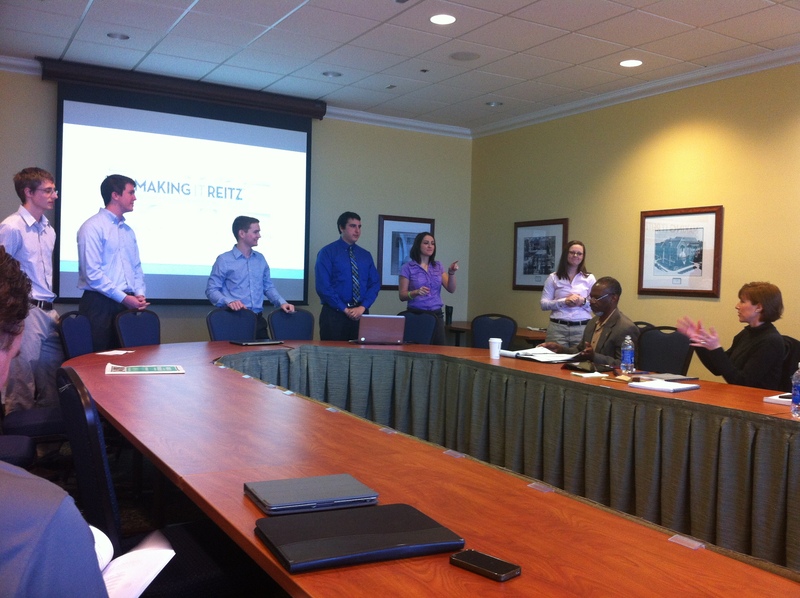 Gainesville, FL: A team of seven Industrial and Systems Engineering students applied their tools and time to the Reitz Union Renovation project slated to start construction this summer. Specifically, the team was tasked by the University of Florida’s Division of Student Affairs to quantify the foot-traffic across the Reitz Union’s colonnade. The team organized and conducted a time study leveraging 81 student volunteers, from 8am to 6:30pm, for one week, to identify current state, peak travel times and their associated maximum traffic across five Colonnade entry points. They presented their findings on Wednesday, February 27 to those overseeing the project and members of Cannon Design, the firm leading the renovation effort. In order to provide recommendations on entryway sizes and locations, the team analyzed peak travel times, locations, and respective days, as well as the likelihood of a student’s path throughout the Colonnade given their entry point to the Colonnade. These various analyses coupled with research of several different door throughput rates allowed the team to analyze the current flow across the Colonnade and therein estimate the validity of future designs. The student team also offered their opinions on the new design and technologies that could be leveraged to provide more accurate pedestrian counts in the future. The team consisted of Randy Bush, Angela Daly, Andrew Daw, Sean Douglas, Elizabeth Gillett, Kory Harb, and Mark Hettig.